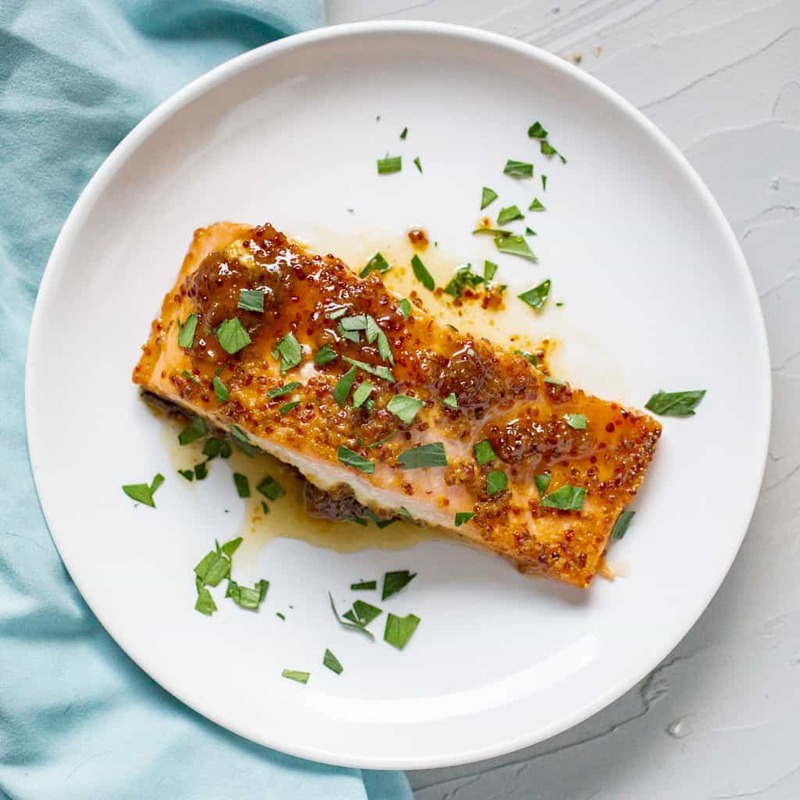 A sheet pan recipe for 3-ingredient maple mustard salmon. Easy to prepare and easy to clean up, the perfect weeknight dinner! I never liked eating fish much growing up. It wasn’t until a trip to Vancouver with my family in high school that I had my first memorable fish dish: cedar planked salmon with maple glaze. I don’t remember the restaurant or anything else about the meal, but I do remember the fresh, flaky, perfectly cooked salmon served on a plank of cedar with a sweet maple syrup glaze. That trip opened up a new world of seafood to me, from the memorable salmon meal to sushi restaurants serving up fresh seafood within walking distance of our hotel. 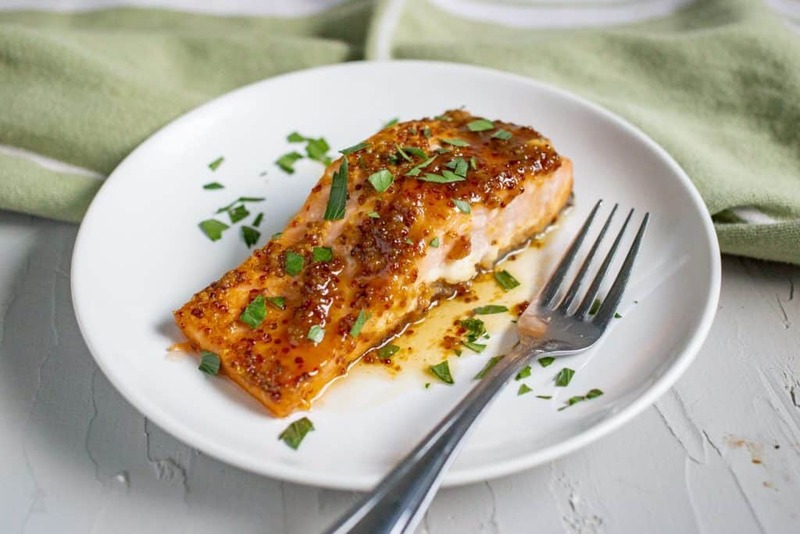 This maple mustard salmon recipes is now one of my favorite weeknight dinners. It brings back memories of that trip to Vancouver, is easy to make, very flavorful, and even easy to clean up. I hope you enjoy it as much as I do! Preheat the oven to 425 degrees F. Then make the glaze by mixing together the mustard and real maple syrup in a small bowl. I used a mix of Dijon mustard for the flavor and stone ground mustard for texture. 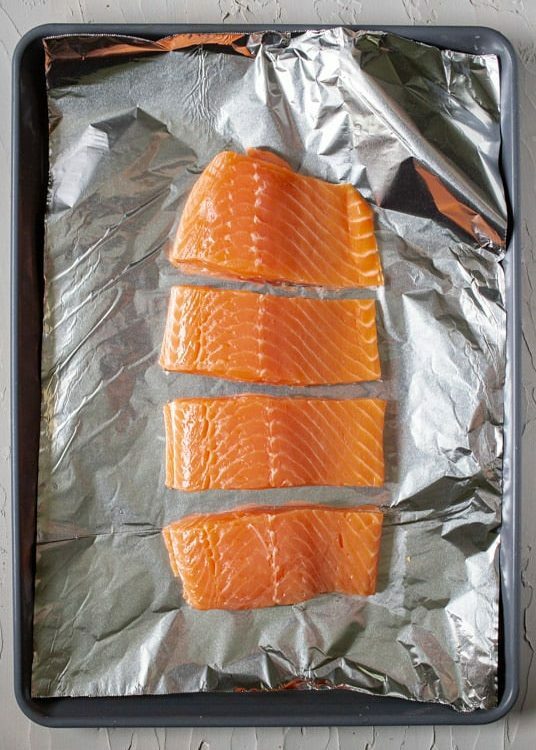 Place your salmon fillets on one large sheet of foil right next to each other and fold over the edges of the foil to create a foil boat for the salmon. 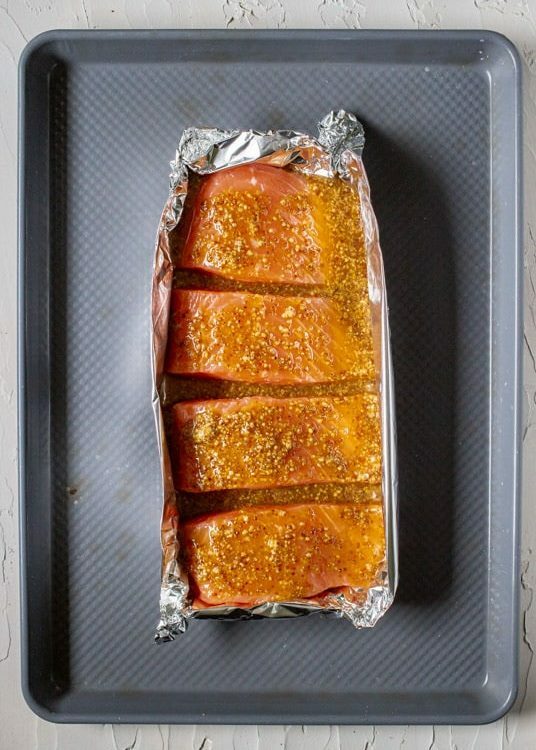 The goal is to have sealed corners so that when you pour the maple mustard glaze over the salmon it will stay around the salmon and not leak onto the sheet pan. This will keep the salmon moist and flavorful and will also make cleanup a breeze. Bake for 12 to 24 minutes until the salmon is flaky and cooked through. The bake time will depend on the thickness of the fillets. I like to serve with some couscous (easy to make while the salmon is baking) and some microwaved green beans. 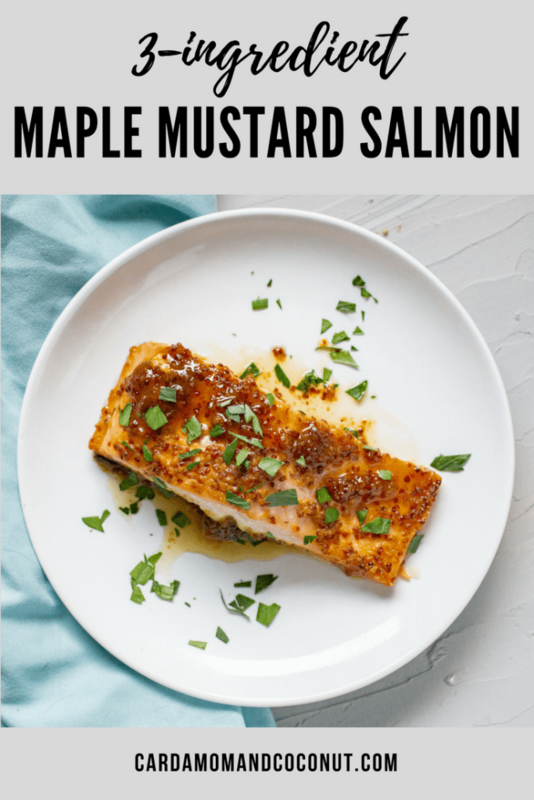 If you try this recipe for maple mustard salmon, leave a comment and review below and let me know how you liked it! In a small bowl mix together the mustard and maple syrup. 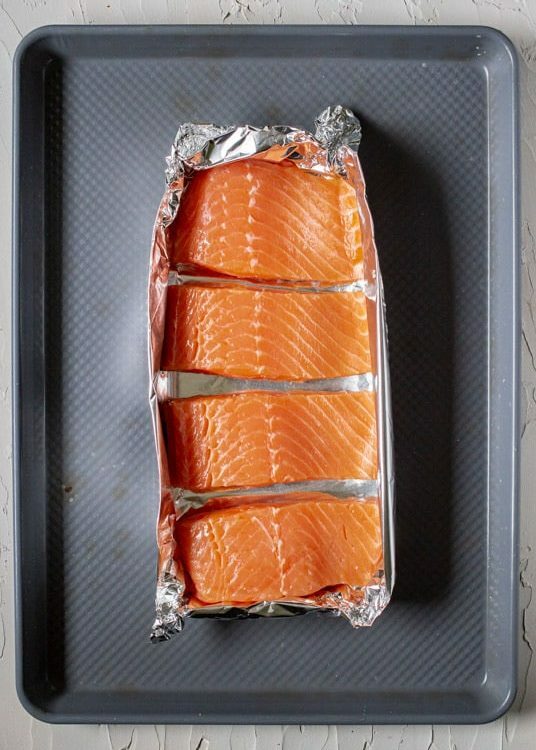 Put a large piece of foil on a baking sheet and place the salmon fillets in the center, skin side down. Fold the edges of the foil around the salmon to form a bowl, make sure the corners are sealed. 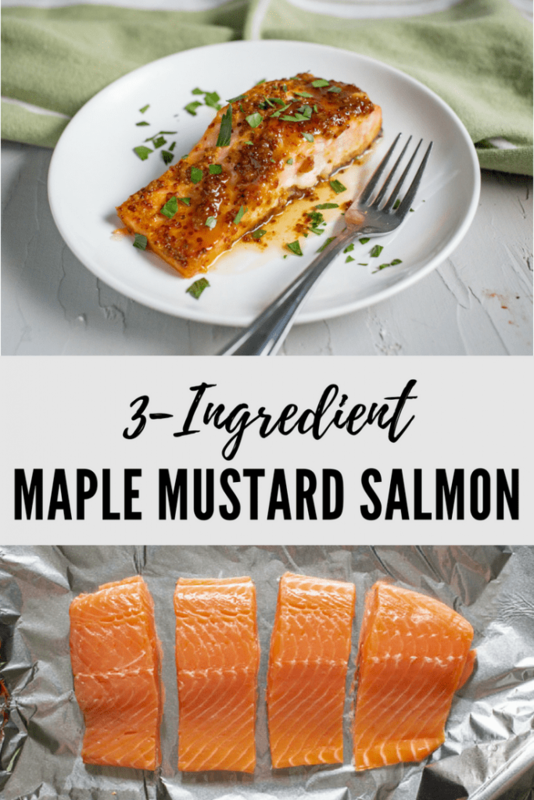 Pour the maple mustard mixture over the salmon and bake for 12-24 minutes until flaky (bake time will depend on the thickness of your fillets). I love maple and mustard together and it kinda great on salmon. I’ve been looking for seafood recipes recently, and this one looks super yummy! My mouth is watering! This is such a lovely dish for entertaining. You had me at easy clean up! This salmon looks absolutely incredible! I love how quickly it comes together. What an easy recipe! Can really appreciate the simplicity to this salmon recipe. Sheet pan recipes have a special place in my heart due to their easy clean up! And this recipe has great flavors, plus it is healthy! Yum! I love salmon and am always looking for new recipes!! Can’t wait to try this! This salmon sounds so flavorful! I love the maple and mustard combination. 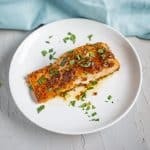 The is one of the best looking salmon recipes I’ve ever seen. Can’t wait to make it! Made this recipe last week … Oh My Goodness! Oh so good! Thank you for allowing us to use it in our menu plans!